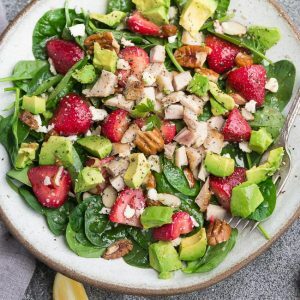 Strawberry Spinach Salad with Avocado, Chicken and Lemon Dressing made with fresh greens, creamy avocado, sweet strawberries, pecans and fresh herbs. A healthy low carb & paleo lunch or light dinner. Spinach salads are one of my absolute favorite things to make for lunch. They are healthy, delicious and the perfect base for using up whatever you have leftover in your fridge. The best part is, they are simple to customize and can be ready on your dinner table in under 30 minutes. 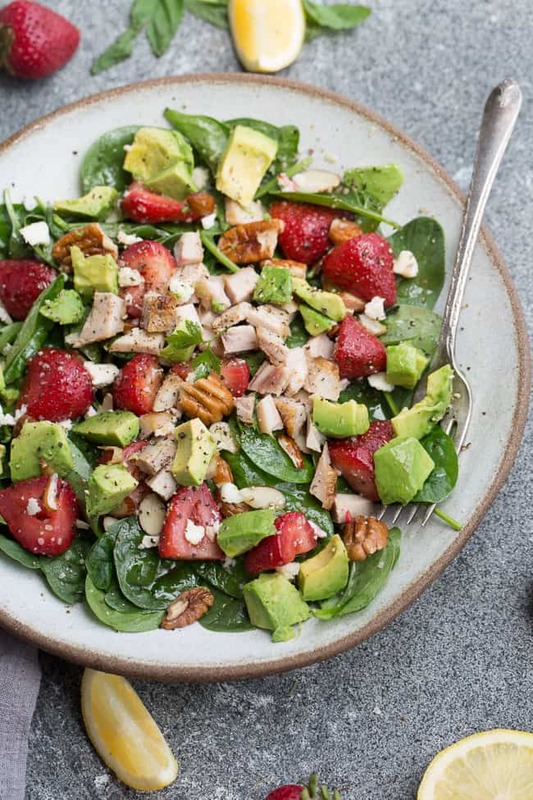 This Strawberry Spinach Salad is fresh, flavorful and loaded with everything I love. It’s got some sweet summery berries, organic baby greens and some creamy avocado. Plus, it also happens to be gluten free, low carb, keto and can be paleo friendly if you leave out the cheese. You start off by add all of the ingredients for the dressing into a bowl or jar. Whisk or shake until combined. The dressing is made with creamy coconut milk, avocado oil, apple cider vinegar, lemon juice, ground mustard, poppy-seeds and salt and pepper to taste. 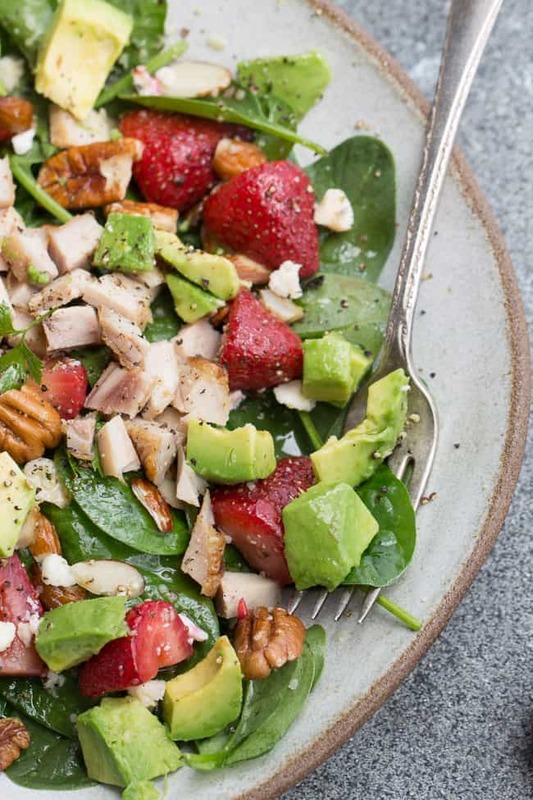 In a large bowl, add the spinach, sliced strawberries, avocado, chopped pecans, slivered almonds and shredded chicken. Pour the homemade dressing over and toss to combine. Top with fresh herbs and/or goat cheese or crumbled feta (leave out for whole 30 and paleo) and serve immediately. WHAT OTHER INGREDIENTS GO WELL IN A STRAWBERRY SPINACH SALAD? You can add more or less spinach depending on what you like or toss in some crunchy romaine lettuce for an extra layer of flavor. Not a fan of avocado? No problem, I am a BIG avocado lover but feel free to leave it out. Got lots of berries on hand? Go ahead and toss some blueberries or blackberries in here as well. For a complete meal, add grilled or shredded rotisserie chicken. To keep this salad dairy free and/or nut-free, leave out the cheese, almonds and chopped pecans. 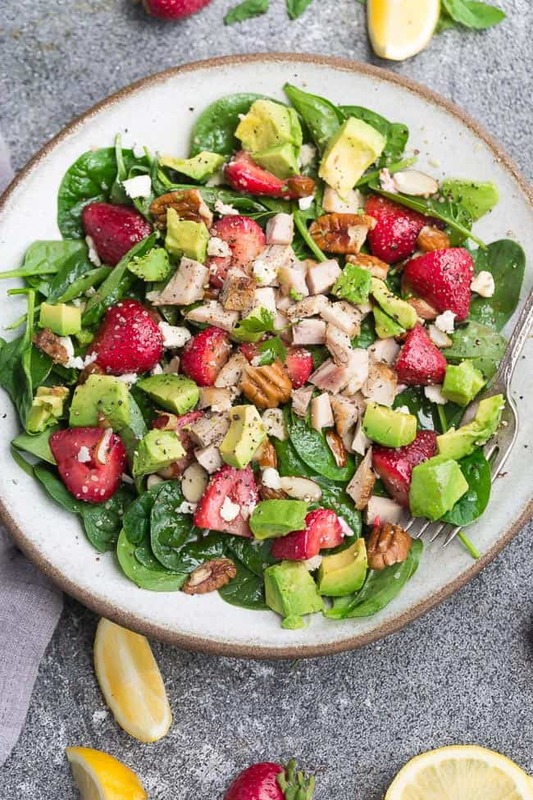 WHAT DRESSING GOES WELL WITH STRAWBERRY SPINACH SALAD? The great thing about spinach salads is how versatile they are. You can pretty much use any dressing you like or have on hand but balsamic, poppy-seed or a raspberry vinaigrette are some delicious choices. CAN I MAKE THIS SPINACH SALAD AHEAD OF TIME? Yes, absolutely. Just combine and store the dressing into a separate container with a lid, until you’re ready to use it. Prepare the spinach and strawberries beforehand and store them covered in the fridge. The avocado doesn’t store all that well after it’s cubed, so I would recommend cutting and slicing just before serving. 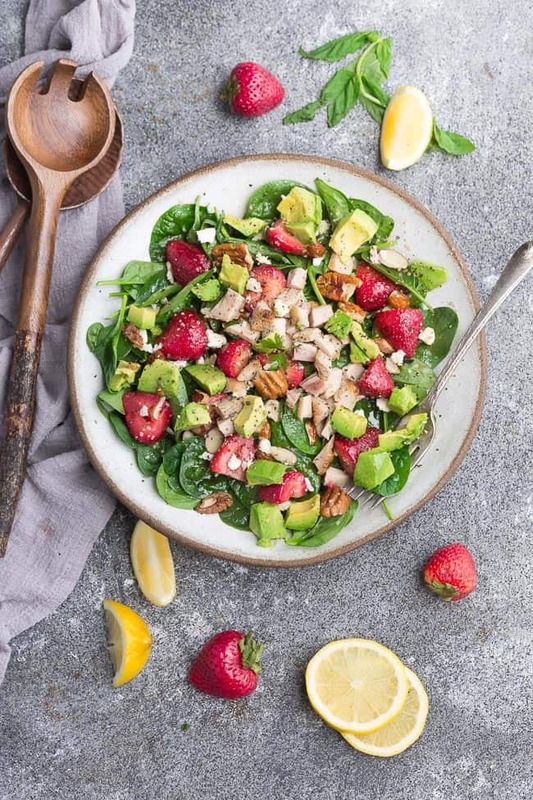 Strawberry Spinach Salad with Avocado, Chicken and Lemon Dressing made with fresh greens, creamy avocado, sweet strawberries, pecans, almonds and goat cheese. A healthy low carb & paleo lunch or light dinner. Add all the dressing ingredients to a bowl or a jar and mix to combine. In a large mixing bowl, add spinach, basil, strawberries, almonds and pecans. Pour dressing over salad and gently toss to combine. Serve immediately with more chopped pecans and crumbled feta, if desired. I made this for a birthday party yesterday. It was devoured immediately. Except for I added roasted almonds and it’s pretty much the whole bag instead of the few tablespoons. I also pit in a hand full of blue berries. So Good!